Summary. In recent years, we have discussed the correlation of malignant tumor process with the development of osteoporosis, which can be exacerbated by ongoing chemotherapy and radiation therapy. The aim of the work was to assess the status of bone metabolism in 32 untreated patients with lung cancer without metastasis. Materials and Methods: Patients underwent dual-energy X-ray osteodensitometry of proximal part of femoral bone. Osteopontin (OP), osteocalcin (OC) and alkaline phosphatase (AP) parameters were studied in blood, as well as osteo-associated chemical elements. Results: Lung cancer proceeds with severe disorders of bone metabolism, which is accompanied by an increase in blood levels of OP, OС, AP, phosphorus, lithium, lead, strontium and cobalt against a decrease of calcium, magnesium and manganese, which were observed in 75; 78; 31; 100; 66; 47; 44; 3; 100; 100, and 6% of patients, respectively; such disorder was associated with a morphological variant of the tumor (cobalt) and stage of disease (calcium, magnesium, manganese, strontium), development of osteodeficit (OP, OC, AR, strontium, zinc). Osteodeficit in the form of osteopenia and osteoporosis is observed more common in women, in every second patient, and osteodensimetric T-score depends on the age of patients, directly correlates with the values of the OP and OC, and inversely — with a zincemia rate. Conclusions: The disorders of bone metabolism in patients with lung cancer indicate the need for the development of antiosteoporosis treatment for cancer patients. Abbreviations used: AP — alkaline phosphatase; BF — Brown — Forsythe’s test; BMM — bone metabolism markers; LC — lung cancer; M — mean values; OC — osteocalcin; OP — osteopontin; SD — standard deviations; SE — standard errors; WR — Wilcoxon — Rao test. Lung cancer (LC) occupies the first place in the structure of oncological morbidity and it is one of the main causes of the death [1–3]. The incidence of LC is 62 per 100,000 population among men and 30 per 100,000 among women, besides these parameters rise every year . Every fourth case among all newly registered cancer patients and every third cancer-related death are related to LC . The osteodeficiency is involved into the pathological process in half of the number of the patients suffering from malignant tumors . Osteoporosis in cancer patients is often formed as a result of arising defects of sexual and calcium regulating hormones in the body . In LC the changes of bone mineral density take place and the prevalence of osteoporotic vertebral fractures achieves 30–40% of such patients according to clinical and sectional studies . LC may be accompanied by the imbalance of osteoassociated trace elements  and calcium metabolic disturbances with hyperproduction of osteocalcin (OC) and osteopontin (OP) relating to the main biochemical bone metabolism markers (BMM) . It was observed that the increased synthesis of OC and OP which were involved in the processes of the reconstruction of bone tissue  and determined the development of osteoporosis  referred to the factors of adverse LC course [13, 14]. According to Kang et al. and Li et al. , the presence of OP in the blood is directly associated with the presence of metastases in patients with LC. However, Zou et al. suggested that the role of BMM in the development of non-small cell LC and osteoporosis remains controversial. The aim of the study was to assess the level of changes of BMM and osteo-associated chemical elements in the blood of the patients with LC, their possible association with morphological variants of the disease, the stage of the pathological process and the presence of osteodeficiency (osteopenia, osteoporosis). The study included 32 patients with LC without distant metastases at the age of 35 to 76 years (on average 55.6 ± 2.1 years) who had not received chemo- or radiotherapy previously. The patients have been treated at Donetsk Regional Anticancer Center and National Cancer Institute (Kyiv), the study was approved by Donetsk National Medical University Bioethics Commission. 23 men (71.9%) and 9 (28.1%) women were among these patients. The duration of the manifestation of LC constituted 19.7 ± 1.5 months in average. The ratio of mediastinal, lower lobe, left-upper lower lobe, right-middle upper lobe and upper lobe localization was 1:1:2:2:2. 78.1% of the patients had the central form of LC and 21.9% — peripheral, ¼ — small cell LC and ¾ — non-small cell LC (adenocarcinoma, squamous and large cell carcinoma). The ratio of IA, IB, IIA, IIIB, IIB and IIIA stages of LC came to 1:2:3:3:4:4. The methods of radiography, computed and magnetic resonance tomography (Multix-Compact-Siemens, Germany; Somazom-Emotion-6-Siemens, Germany; Gygoscan-Intera-Philips, Netherlands) have been used for the diagnosis of the disease. Dual-energy X-ray osteodensitometry of the proximal femur (QDR-4500-Delphi-Hologic, USA) has been performed. In the context of the objectives of the study it indicates BMM — the maintenance of OC and OP in the blood serum. The activity of alkaline phosphatase (AP) was determined using the automated biochemical analyzer Olympus-AU640 (Japan), OC and OP values — by immunoassay analysis (reader PR2100-Sanofi Diagnostic Pasteur, France, set R&D-Systems, USA), the levels of osteo-associated chemical macroelements (calcium — Ca, magnesium — Mg, phosphorus — P) — by atomic emission spectrometry with inductively bound argon plasma (apparatus IRIS-Intepid-II-XDL, United Kingdom) and microelements (iron — Fe, cobalt — Co, lithium — Li, manganese — Mn, copper — Cu, lead — Pb, strontium — Sr, zinc — Zn) — by atomic absorption spectrometry with electrographite atomizer (apparatus SolAAr-Mk2-MOZe, United Kingdom). As a control group, 40 healthy individuals (22 men and 18 women, aged 41.7 ± 5.6 years) have been surveyed and corresponding parameters were assessed. Statistical processing of the data has been carried out using computer variation, nonparametric, correlation, regression, one-way (ANOVA) and multivariate (ANOVA/MANOVA) analysis of variance (program Microsoft Excel and Statistica-Stat Soft, USA). Mean values (M), standard deviations (SD) and their standard errors (m), Pearson correlation coefficient (r), multiple regression (R), Brown and Forsythe’s test of variance (BF) and Wilcoxon — Rao (WR), Students’ t-test (t), MacNemar — Fisher (χ2), accuracy of statistical parameters (p) were calculated. The critical level of significance was taken as < 0.05. We have analyzed the indexes of bone metabolism and have revealed that they differ significantly between the control group (healthy individuals) and patients with LC. As we have found (Table), in patients with LC parameters P increase by 14.3 times, OC — by 2.6 times, OP — by 81%, Li — by 74%, Pb — by 63%, Sr — by 54%, AP — by 35%, Co — by 24% with the decrease of Mg concentrations by 91%, Ca — by 46%, and Mn — by 31%. Thus, against the background of increasing the content of bone metabolism organic markers (AP, OC, OP) there is a deficit of essential (vital) microelements (Ca, Mg) in the hyperproduction of toxic microelements (Co, Li, Pb, Sr). The changes (< M ± 2SD > healthy people) Ca, Mg, P, OC, OP, Li, Pb, Sr, AP, Mn, Co are found respectively in 100; 100; 100; 78; 75; 66; 47; 44; 31; 6 and 3% of the patients with LC. According to the results of multivariate analysis of variance of Wilcoxon — Rao, the integral state of BΜM and chemical elements are affected by the stage of LC (WR = 2.61, p = 0.047), but they are not influenced by patients’ gender and age, the duration and morphological form of the disease. As evidenced by one-way ANOVA of Brown — Forsythe, the duration of the disease affects phosphatemia level (BF = 7.97, p = 0.004), and the parameters of Ca (BF = 3.23, p = 0.045) and Mg (BF = 4.04, p = 0.039) in the blood depend on the stage of LC. According to the patients’ age the values of OP (r = 0.397, p = 0.024) increase, but the concentration of Zn (r = −0.359, p = 0.048) decreases. There is a direct regression linkage of Sr level (R = 2.42, p = 0.027) and there is a reverse one of Mn level (R = −2.59, p = 0.019) with the stage of LC in the serum. In blood of non-small cell LC patients, Co level was higher than in blood of patients with small cell LC by 11% (t = 3.33, p = 0.002) (Fig. 1). It should be noted that Co is included in cyanocobalamin and some enzymes (acylase, glycylglycine dipeptidase, cholinesterase), and the highest quantity of this ion is present in the liver and thyroid gland. Since all the salts of Co are chemical carcinogens, so this trace element is among the quite significant risk factors of LC. 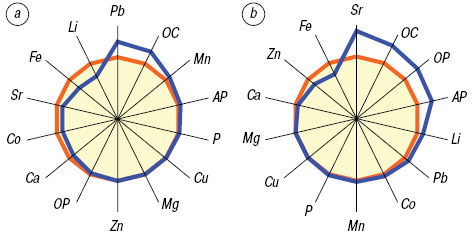 The increase of Co level in the bones is accompanied by the rise of the concentration of amino acids, monocyte chemotactic protein 1 and matrix metalloproteinases activity in the blood. Osteodeficiency (osteopenia, osteoporosis) has been diagnosed in 46.9% of the LC patients, and densitometric T-test has been −1.17 ± 0.110 a.u. We have established gender dimorphism of osteodeficiency with its more frequent development in women suffering from LC (χ2 = 4.80, p = 0.028), while the frequency of osteopenia/osteoporosis was independent of the morphological variant of the disease (Fig. 2, 3). According to the data of ANOVA, the parameters of T-test are affected by the age of the patients with LC (BF = 6.28, p < 0.001), and as correlation analysis demonstrated, there is a direct linkage of the parameters of T-test with the levels of OC (r = 0.740, p < 0.001) and OP (r = 0.812, p < 0.001), and reverse one — with the indicators of zincemia (r = −0.572, p = 0.001). Osteodeficiency in LC is accompanied by the increase of the OC content in the blood serum by 30% (t = 2.74, p = 0.010), OP — by 27% (t = 4.93, p < 0.001), AP — by 25% (t = 2.08, p = 0.047) and Sr — by 41% (t = 2.96; p = 0.006) with the decrease of Zn level (t = 2.44, p = 0.021) by 12%. We emphasize that Zn refers to oncoprotective trace elements [18, 19]. Wulaningsih et al. showed that a high level of P in the blood was a risk factor for the development of LC. The mechanisms which cause the lesion of bone tissue in the patients with LC are complex and they are the result of complex interactions of the tumor and the bone system. There are osteoblasts on the surface of the bone that produce matrix vesicles containing Ca and P, and the main function of these cells is protein synthesis, the formation of the collagen network, the production of OC, OP and other substances. Compound components of the intercellular matrix bind adhesion proteins that interact with the cell receptors (integrins), fix the cells in the intercellular space. Co, Cu, Fe, Mn, and Zn have unfilled d-electronic layers that determine their ability to participate in various oxidizing and reduction processes in the bone. The imbalance of the levels of these trace elements in LC leads to metabolic and structural changes in bone tissue. Low Mg level in LC can increase the absorption of Ca and a high level of P activates this process. It should be noted that an excess of Mg usually results in the stimulation of osteoclasts and the abnormalities of the structural and functional state of the bone and the development of hypercalciumemia observed in LC metastases into the bone; it is of differential and diagnostic value in osteopenia/osteoporosis. A reduced level of Mn in LC disturbs the biosynthesis of acid mucopolysaccharides, decreases the level of hexuronic acids, glucosamine and galactosamine in bone tissue, thereby stimulating the development of osteoporosis. A considerable part of Pb entering the body accumulates in bone tissue and in the case of the excess of its concentration in patients with LC bone density dramatically weakens. Pb in these patients is able to replace Ca in bone tissue and release during bone demineralization. In the patients with LC, low Ca level enhances the absorption of Pb, and the antagonist in this process is Zn depressing the level of bone Pb. Oncogenic Sr has tropic properties in regard to bone tissue, and participates in the processes of ossification along with Ca on the surface of the bone. LC progresses with marked disorders of bone metabolism which are accompanied by the increase of P, OC, OP, Li, Pb, Sr, AP and Co levels in the blood, on the background of the reduction of Ca, Mg and Mn that are respectively observed in 100; 78; 75; 66; 47; 44; 31; 3; 100; 100 and 6% of the patients. Modifying bone metabolism is associated with morphological variant of the tumor (Co) and LC stage (Ca, Mg, Mn, Sr) as well as with the development of osteodeficiency (OC, OP, AP, Sr, Zn) which is seen in every second patient with LC in the form of osteopenia or osteoporosis, more common in women. 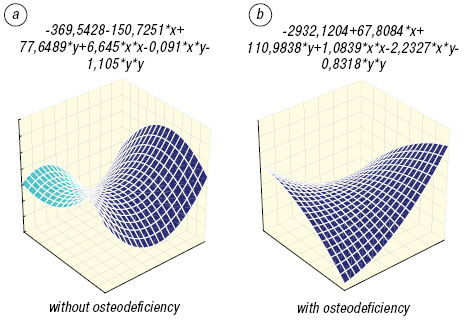 Osteodensitometry T-score depends on the patients’ age, it is directly correlated with the values of OC and OP, and inversely — with concentration of Zn. The disorders of bone metabolism in LC indicate the need for the development of antiosteoporosis treatment for cancer patients. Ceniceros L, Aristu J, Castanon E, et al. Stereotactic body radiotherapy (SBRT) for the treatment of inoperable stage I non-small cell lung cancer patients. Clin Transl Oncol 2015; 55: 213–9. Grаdalska-Lampart M, Karczmarek-Borowska B, Radziszewska AU. Lung cancer in Podkarpackie region in the years 2002–2011. Pneumonol Alergol Pol 2015; 83: 109–19. Kukulj S, Popovic F, Budimir B, et al. Smoking beha­viors and lung cancer epidemiology: a cohort study. Psychiatr Danub 2014; 26: 485–9. Zhou C. Lung cancer molecular epidemiology in China: recent trends. Transl Lung Cancer Res 2014; 3: 270–9. Molassiotis A, Bailey C, Caress A, Tan JY. Interventions for cough in cancer. Cochrane Database Syst Rev 2015; 19: 007881. Rizzoli R, Body JJ, Brandi ML, et al. Cancer-associated bone disease. Osteoporos Int 2013; 24: 2929–53. Coleman R, Body JJ, Aapro M, Hadji P. Bone health in cancer patients: ESMO clinical practice guidelines. Ann Oncol 2014; 25: 124–37. Buckens CF, van der Graaf Y, Verkooijen YM, et al. Osteoporosis markers on low-dose lung cancer screening chest computed tomography scans predict all-cause mortality. Eur Radiol 2015; 25: 132–9. Huang H, Huang JY, Lung CC, et al. Cell-type specificity of lung cancer associated with low-dose soil heavy metal contamination in Taiwan: an ecological study. BMC Public Health 2013; 10: 330–40. Wisinski KB, Ledesma WM, Kolesar J, et al. A phase I study to determine the maximum tolerated dose and safety of oral LR-103 (1α,24(S)Dihydroxyvitamin D2) in patients with advanced cancer. J Oncol Pharm Pract 2014; 11: 125–32. Zhang B, Dai J, Wang H, et al. Anti-osteopontin monoclonal antibody prevents ovariectomy-induced osteoporosis in mice by promotion of osteoclast apoptosis. Biochem Biophys Res Commun 2014; 452: 795–800. Klahan S, Kuo CN, Chien SC, et al. Osteoporosis increases subsequent risk of gallstone: a nationwide population-based cohort study in Taiwan. BMC Gastroenterol 2014; 18: 192–9. Lin Q, Xue L, Tian T, et al. Prognostic value of serum IL-17 and VEGF levels in small cell lung cancer. Int J Biol Markers 2015; 30: 165–75. Ostheimer C, Bache M, Güttler A, Reese T. Prognostic information of serial plasma osteopontin measurement in radiotherapy of non-small-cell lung cancer. BMC Cancer 2014; 21: 858–65. Kang GG, Han HJ, Lee HJ, et al. Rho-associated kinase signaling is required for osteopontin-induced cell invasion through inactivating cofilin in human non-small cell lung cancer cell lines. Bioorg Med Chem Lett 2015; 25: 1956–60. Li Y, Sun BS, Pei B, et al. Osteopontin-expressing macrophages in non-small cell lung cancer predict survival. Ann Thorac Surg 2015; 99: 1140–8. Zou XL, Wang C, Liu KE, et al. Prognostic significance of osteopontin expression in non-small-cell lung cancer: A meta-analysis. Mol Clin Oncol 2015; 3: 633–8. Kopanski Z, Piekoszewski W, Habiniak J, et al. The clinical value of the determinations in the serum of zinc concentration in women with breast cancer. Folia Histochem Cytobiol 2010; 39: 84–6. Li P, Xu J, Shi Y, et al. Association between zinc intake and risk of digestive tract cancers: a systematic review and meta-analysis. Clin Nutr 2014; 33: 415–20. Wulaningsih W, Michaelsson K, Garmo H, et al. Inorganic phosphate and the risk of cancer in the Swedish AMORIS study. BMC Cancer 2013; 24: 257–62.